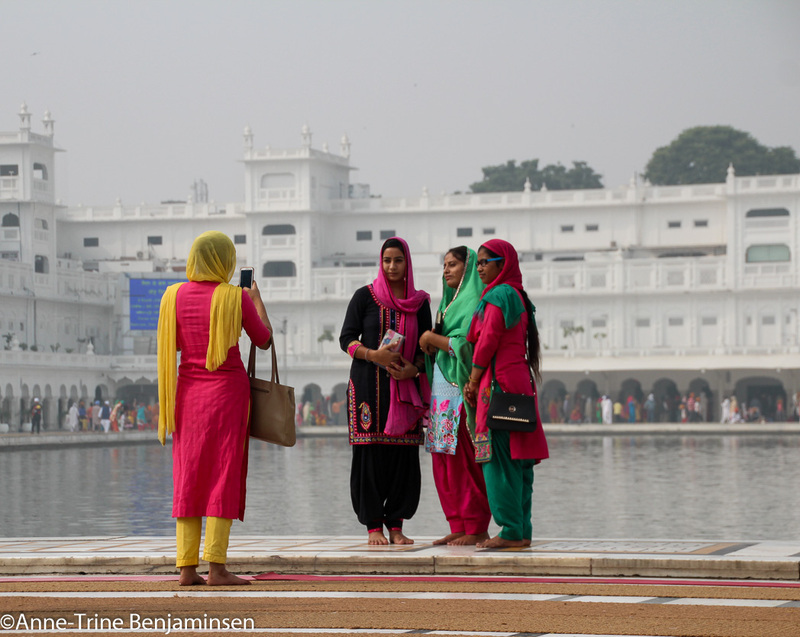 We weren’t exactly Thelma and Louse, but three women on a day trip to Amritsar. It was Elisa, Peggy and me; wheels up for The Golden Temple after an early start in Delhi. With no time to lose, we almost rushed out of Sri Guru Ram Das Jee airport, after paying the pre-paid taxi boot a visit. The landscape outside the taxi windows was flat and nondescript, I had no idea about what to expect from the city itself only that it hosted a famous temple. We entered the town and the taxi stopped without warning. “Jam,” the driver grunted and almost shooed us out to fight the usual Indian buzz; cars, two-wheelers, three-wheelers, honking horns, stray dogs, stray children, beggars, hawkers. We made sure we were walking in the right direction and cast long glances after the many shops selling juttis, the colourful Punjabi footwear. This is what we’re buying later today, we all agreed. Souvenir and shoe shops replaced each other in a steady stream, the city landscape gradually changed – no doubt were we on the way to an attraction. The temple area was, at first glance, like a revelation. The big plaza was clean and pure and after parting with our shoes and covering our heads, we joined the surprisingly modest queue. It didn’t take us long to enter the inner temple area. I simply couldn’t elude a gasp when I spotted The Golden Temple. The square, golden building seems to be floating in a vast pool, all surrounded by white marble. It hurt in all its splendour, I had as always forgotten my sunglasses! 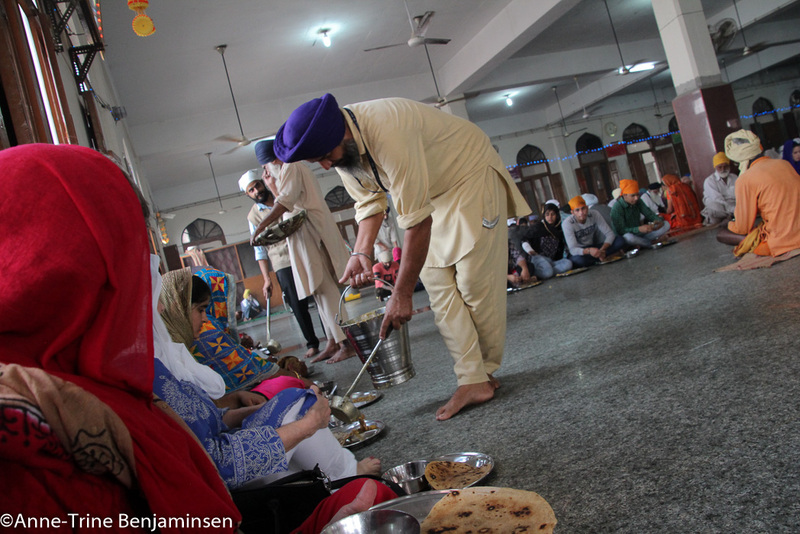 Every Sikh temple has a langar, a community kitchen, where food is served for free. We admired the temple for a while before we obeyed our rumbling stomachs and headed for the langar. 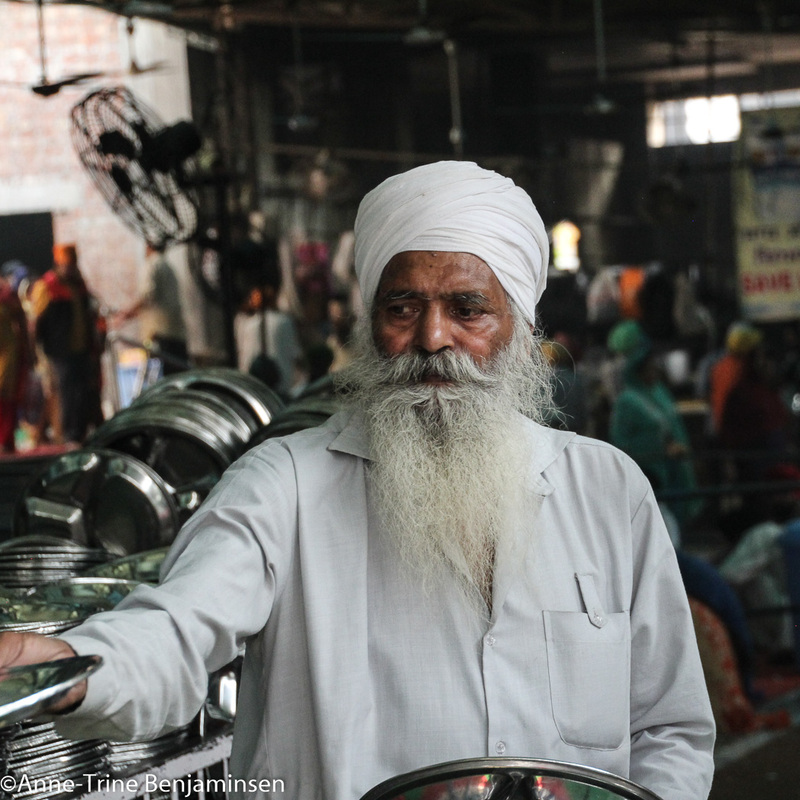 Every Sikh temple runs a community kitchen that serves free food. I’m not sure if we belonged to the target group, but the langar, in principle, welcomes everybody and it was our only option. All kinds of clatter filled the building as we entered, people were in a steady move, or sitting down at work; chopping or peeling. Everybody is welcome to give a helping hand with the food, but we were on a budget as far as time was concerned, accepted a plate each and followed the crowd up to the first floor were people sat eating on the floor in long rows. The room was huge. My general fear of food hit me hard and dal from a grimy bucket didn’t tempt me. Instead, I polished off a number of chapattis. Not only had I forgotten my sunglasses, my rucksack contained (surprisingly) no ‘iron rations’. Peggy and Elisa said yes to second helpings, I couldn’t believe it, they seemed to have the meal of their life. Handing out plates to the visitors. Afterwards, we sat down under the archway. Leaning towards the wall, we did some serious people watching. In between, we all – I believe – closed our eyes and let the chanting music lull us into a light after lunch nap. The temple, separated by the sparkling water, shone in all its glory. 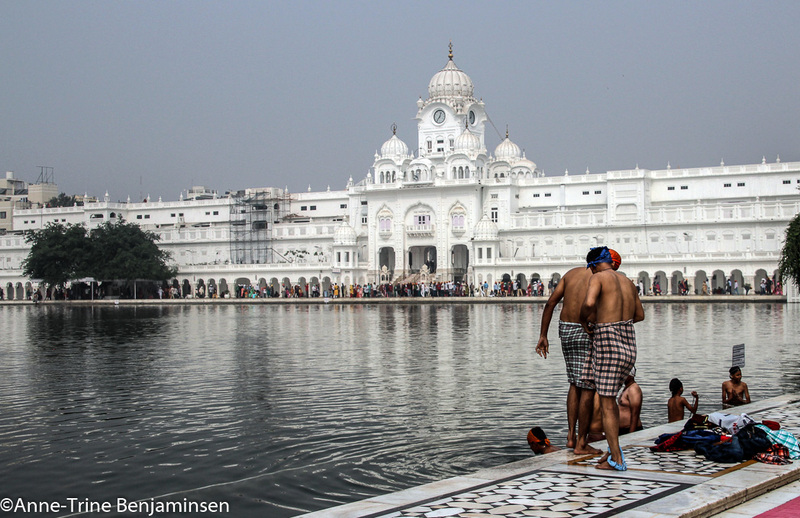 People were floating by in a steady, endless stream: stately and well-dressed Sikhs in a variety of coloured turbans, equally colourful women in their best Punjabi dresses, people in various headscarves, a few children here and there. A small crowd of young men were dipping their bodies in the water. 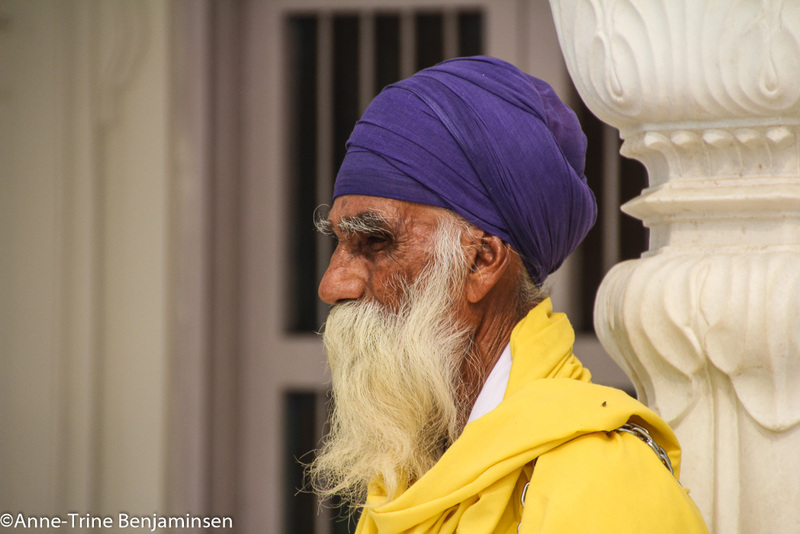 I remember the old woman with her husband bent double in a wheelchair, maybe his first, or last, visit to the Golden Temple. I was enchanted by all the bright colours towards the white, marbled landscape and drifted in and out of silent appreciation. We spent a while, strolling back and forth but never entered the temple itself. The long queue combined with the baking sun made the thought uncomfortable. Reluctantly, we eventually left the temple grounds. What surprised me, was the lack of Western tourists. We hardly saw any, which made us an easy target for Indians hunting for good ‘snaps’, especially inside the historical site and garden, Jallianwala Bagh. 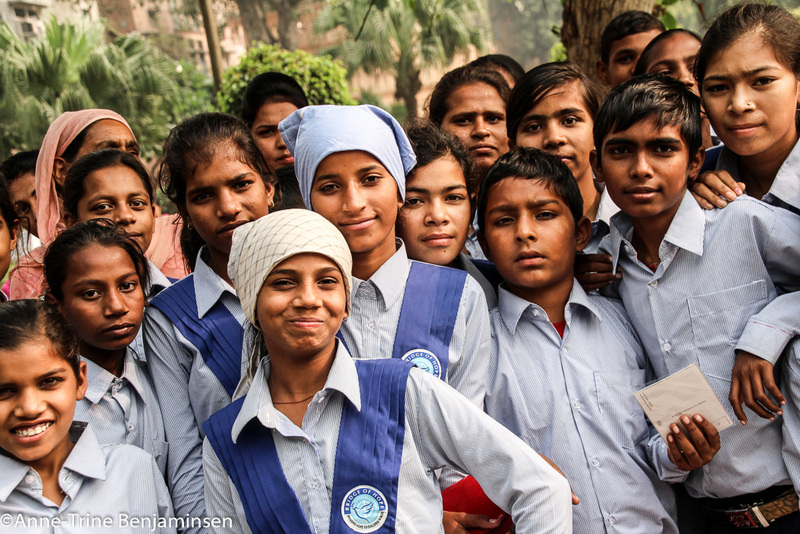 We dutifully posed once, twice, thrice … Peggy was under the impression I was the star attraction in Amritsar on that very day. It might be. For Indians unfamiliar with people from the West, my indefinable hair colour might rise some interest. And while Peggy and Elisa was dressed in Punjabi dresses, I was as always dressed in jeans. Because every time I put on a pair of kameez, those wide Indian trousers, I feel my height shrink from 162 to 152 cm. I remember the parents who eagerly pushed their little son, aged about three, towards me again and again, cell phones ready in their hands. Their hard voices eventually made him obey, and then he turned, pointed a finger towards me and let out a big cry. I almost cried out myself, and later wondered how that picture came out. A small, frightened Indian boy and a frightful Norwegian troll. They, among many others, wanted us in their photo. How could we say no? Amritsar seemed to have many faces. In stark contrast to the area where the taxi let us off, was a pedestrian area close to the temple. Wide, clean streets, uniform shop fronts and nicely dressed people strolling leisurely about. 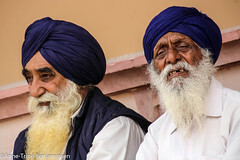 They all seemed to have paid a visit to the temple and was now savouring ice cream or “Amritsari Special Matka Kulfi”. 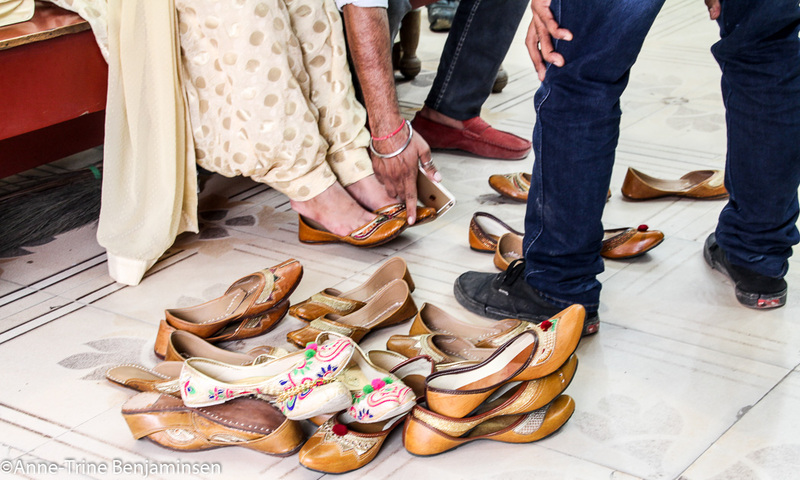 We explored some shoe stores, but eventually agreed that the Punjabi juttis probably wouldn’t feel – in any way – comfortable in Norway, neither in Boston nor New York. Buying juttis can be an ardous task! I suggested we go back to the airport a little early and eat our dinner to avoid any late minute rush to the airport. (I’m neurotic about losing a flight.) So we set about to find a taxi – which turned out to be an arduous task. Taxis were nowhere to be seen or found, nobody was able to help and no 800-pages travel guide had been allowed in our light luggage. Auto rickshaws, on the other hand, were plentiful. But Peggy sat down her foot and wouldn’t even speak of a ride all the way to the airport in such an airy vehicle. We managed to cajole her into it, who wanted to spend the night in Amritsar without even a toothbrush? We squeezed together in the back seat after the usual debate over the fare. I had in the course of the day managed to dig up my sunglasses from the depths of my rucksack, now I would need ‘dust glasses’. After a few turns and bends, we came to a halt, the driver left his seat and from what we could understand he didn’t want to take us after all. Then Elisa raised her voice in such a way that even I straightened my back, and off we went again after a slight turmoil. Half way, he made another stop, now at a gas station, he seemed to want extra money for the petrol, to what the three ladies in the back answered an unanimous, smiling no no no – and we eventually arrived at the airport. And yes; by then the driver had become the cutest Indian driver ever and we gave him twice as much as he had asked. (I’m sure this does sound familiar to other India travellers …). The airport seemed to have shrunk in one day. After security, we optimistically went in search for a restaurant, which we scaled down to a café after looking around a bit. We were pointed to the first floor where we found a modest snack bar and a million free seats, air condition on full blast. I had my most meagre dinner ever; one tiny cup of bitter, black coffee and two chocolate bars. Our sole entertainment was a small souvenir shop with absolutely no customers and I seriously had to restrain myself from buying something elephant-ish just to make the shopkeeper’s day. He seemed bored to the bone! We didn’t make it to the Wagah border. Maybe we missed out more. 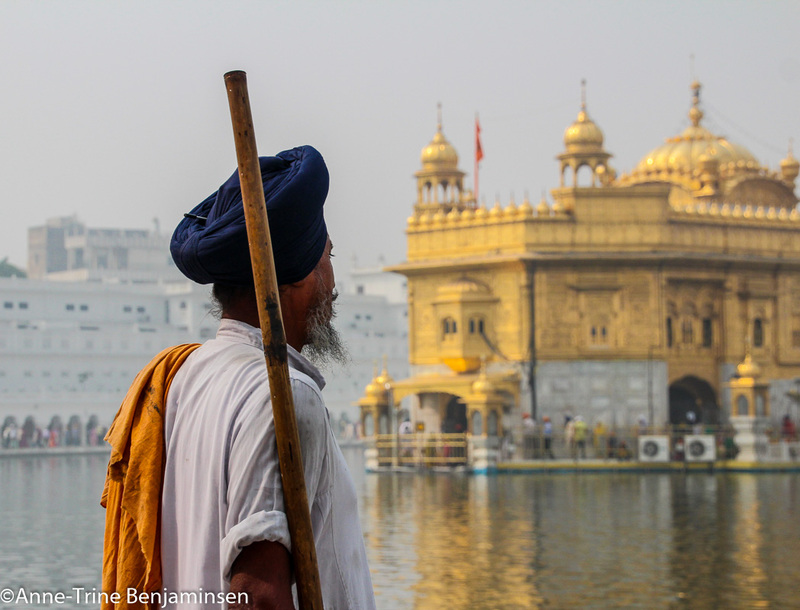 It had probably been Amritsar on speed, but the hours inside the temple grounds were spent in deliberate slow-motion!